Two years ago, Nintendo boss Satoru Iwata made some lofty promises about his company's approach to what was then a new venture for them: downloadable content. Nintendo, he promised, would get it right. "One thing Nintendo has determined as a company policy, what we are not going to do is create a full game and then say, 'let's hold this back for DLC,'" Iwata told Kotaku during a 2012 interview in San Francisco. "That's not our plan. We're definitely not doing that. It's an extreme example, but I think there are examples of games where you get that initial purchase — the very core part of the game — and everything else around it is all DLC. However, if you do that I believe customers will have no motivation to go out and buy the retail package to begin with. So our goal is to create DLC in such a way that consumers do not feel that they have been cheated or deceived." DLC, a catchall phrase that can refer to any sort of digital add-on for a game, has long been a controversial subject in the world of gaming. For close to a decade now, video game publishers have tried to figure out the best ways to sell profitable add-on content, sometimes dreaming up great expansion packs (Mass Effect 2's Lair of the Shadow Broker; Red Dead Redemption's Undead Nightmare) and sometimes leaving customers feeling cheated (The Elder Scrolls IV: Oblivion's infamous horse armor). But it took until 2012 before Nintendo finally dipped their toes into the DLC pool, and the move was coupled with this Iwata promise: they were going to do it in a gamer-friendly way. In other words, Nintendo wasn't going to emulate big publishers like, say, Capcom, which found itself embroiled in controversy after people discovered that the fighting game Street Fighter X Tekken shipped with DLC character files already on the disc—implying that the characters had already been created before the game came out, and that Capcom held them back to sell separately, as downloadable content. So two years later, how is Nintendo doing? Did Iwata keep his promise? Has the company's DLC left fans feeling satisfied or betrayed? On the eve of the release of Super Smash Bros. 3DS, a game that is ripe for downloadable characters and stages but has no announced DLC plans just yet, it's worth taking a look at what Nintendo has and hasn't done with downloadable content. Nintendo has played around with free DLC for a while, most notably with the externally-developed but Nintendo-published Professor Layton series. Their first foray into paid downloadable content in North America for a game they made in-house came with New Super Mario Bros. 2, which was released for 3DS in August of 2012. 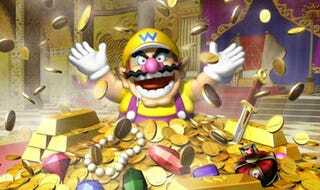 In the months following NSMB2's launch, Nintendo released four different DLC packs, each of which cost $2.50 and came with three Coin Rush courses of varying difficulty. Earlier that year, Iwata had said those DLC packs would be developed after the game was released, incorporating as much fan feedback as possible, and that's what seemed to have happened. It all aligned with what Iwata had promised—here was DLC that supplemented the main game, not completed it. Seven months after the Wii U launch game New Super Mario Bros. U, Nintendo released a meaty $20 add-on called New Super Luigi Bros. U that was essentially a new game—in fact, they later sold Luigi's adventures as a stand-alone retail disc, too. Neither NSMB2 or NSMBU ever felt incomplete—they were full-sized Mario games with around 80 different levels each—and the DLC mostly felt worthy, even if Luigi's journey wasn't received quite as warmly as his redder brother's. And, as promised, in an Iwata Asks interview published in 2013, the company noted that they had started development on New Super Luigi Bros. U just after finishing the original game. Nintendo has taken similar "let's make and sell new stuff!" approaches for big Wii U games like Pikmin 3 and even Mario Kart 8, the latter of which will get huge Zelda and Animal Crossing packs full of characters and courses over the next few months for $8 each (or $12 total). Mario Kart 8 has 32 tracks on its disc, the same number of tracks as its two DLC-less predecessors, Mario Kart 7 and Mario Kart Wii. Perhaps also notable is that Nintendo has not offered any DLC for some of its biggest games, a decision that makes them an outlier compared to other publishers. Specifically, last year's major Zelda release on 3DS, A Link Between Worlds, had no DLC. Neither did 2013's big Mario game for Wii U, Super Mario 3D World. The phrase "season pass" usually refers to a bargain deal encompassing all future DLC for a game. It leaves a bad taste in some gamers' mouths, because it's often coupled with marketing buzzwords like "pre-order now!" and "retailer-exclusive DLC!" Nintendo has been slow to embrace this particular trend, but it's happened, and 2014 games such as Mario Golf: World Tour and Hyrule Warriors have offered their own takes on the season pass. Mario Golf's pass, which costs $15, gives you access to six new courses and three characters. Meanwhile, pay $20 for Hyrule Warriors and you'll get a bunch of new characters, maps, scenarios, weapons, and costumes. Again, this is all fairly standard compared to other equivalent season passes (if a little on the pricier side). The thought of Mario's makers doing season passes might be strange to those of us accustomed to a Nintendo that carves its own bizarre path through the gaming industry, but they don't contradict Iwata's vows for Good DLC. …but something else in Mario Golf: World Tour might run afoul of Nintendo's DLC pledge. When Mario's 3DS golf game launched this past May, it came with something we'd never seen in a Nintendo game before: day-one paid DLC. Right on launch day, you could spend $6 on the Mushroom Pack, which featured two courses and a new character (Toadette). Mario Golf fans were disconcerted. Paid day-one DLC in a Nintendo game? If those courses were ready in time for the game to go live, why weren't they part of the game? Maybe that's not quite what happened, though. Ask any game developer about the day-one DLC stigma and they'll sigh and shake their heads. See, development on a game will sometimes be finished up to two or three months before the game actually ships. And often, some members of a development team, like designers and artists, will finish their work before others, like QA testers and programmers. So parts of a studio will sometimes work on DLC as they finish up a game—potentially with a separate budget—which may be what happened with Mario Golf: World Tour. It's very possible that those Mushroom Pack courses weren't finished until the main game had already gone gold. Nintendo also just released a rather curious bit of free day-one DLC for the externally-developed Wii U game Hyrule Warriors. While you'll have to pay for the aforementioned season pass content, Hyrule Warriors also gave players a new challenge mode and a retro 8-bit sword on day one—perhaps as an incentive to get players to play the game with a live Internet connection at least once? Or to shoehorn extra content that couldn't be ready for the disc? Whatever the case, it's certainly strange to see this sort of thing from a company that, not too long ago, released games and left them nearly untouched post-release, while rival publishers and developers were routinely patching and updating their games. Perhaps the weirdest piece of Nintendo DLC to date is the Mercedes Benz Mario Kart 8 add-on, which is totally free because it's a big ol' car advertisement. Tacky? Kinda, yeah. But is it cheating or deceiving customers? Nah. While assessing how Nintendo has approached DLC over the past two years, we have to talk about an interesting wrinkle that only applies when a major company in one country makes games for a large population of gamers in another. We're speaking, of course, of localization. Take Fire Emblem: Awakening, for example. Awakening hit Japan back in April of 2012, and in the following weeks, Nintendo released a ton of paid DLC packs (including characters, stories, and maps) that continued through November of that year. So when Awakening came to North America in early 2013, all of that content was already designed and drawn. We don't know if it was translated into English by then, but in any other regard, it was done. In theory, Nintendo could have released everything at once for North America as one whole game. Instead, the folks behind Fire Emblem chose to follow a similar weekly schedule for Awakening's DLC, releasing the full game (along with some free extra maps) followed by weeks and weeks of paid DLC. That raises the question: was that content being held back? Or does it not break Iwata's promises because it was always meant to be DLC in the first place? Similarly, the RPG Fantasy Life, which Nintendo will release in North America later this month, has drawn some ire because of a paid day-one DLC pack that will let English speakers buy a new piece of content called Origin Island. This island didn't come with the original Fantasy Life, which launched for Japan in 2012, but it did come with the expansion-slash-remake, Fantasy Life: Link, an upgrade that was released in Japan a year later. Rather than just localizing the upgraded version (as they did with the Square RPG Bravely Default), Nintendo took the original game—along with online multiplayer features from Link—and will sell the rest of the expansion's features as day-one DLC. If that's a little confusing, let's restate: Nintendo will sell an English language version of the original Japanese game—that features a key feature from an improved Japanese version of the game at no extra cost—but will charge players extra to buy another part of the improved Japanese version. Is that an okay move? Is it justifiable? Unacceptable? We're in fuzzy territory, here. While Nintendo has clearly kept Iwata's promises when it comes to the DLC we can buy in games like New Super Mario Bros. U and Mario Kart 8, some of Nintendo's other offerings have been a little less black and white. Remember, Iwata has vowed that Nintendo will not remove or hold back any video game's features or content just to sell them as DLC. Iwata also declared that the latest Animal Crossing—a game that might seem fitting for paid microtransactions—would not have paid DLC, as that would be "unwholesome." It's clear that Nintendo is more interested in offering DLC for its games than it used to be. It's less clear that the company is in full-on Activision, EA, Microsoft or Sony territory, where DLC for nearly every release is a given. Still, they're edging into the DLC business more and more, and it's been fascinating to watch their approach. It'll be particularly interesting to see how the company approaches the new Super Smash Bros. The 3DS version of that game is already out in Japan and will release in North America tomorrow. The Wii U version is slated for this holiday season, likely November, if there are no delays. Fighting games are ripe for DLC—in the form of new characters, new stages and whatnot—but Nintendo has, curiously, not announced a DLC plan for either game (though fans have found evidence that the game contains room for downloadable stages). How they handle DLC for those games, should there be any, will be telling. And then next year will bring a new Zelda for Wii U. Would you pay for extra dungeons? On day one? Three months after release? Would Nintendo do such a thing? We'll see.